What about alcohol? Should we abstain before coming? 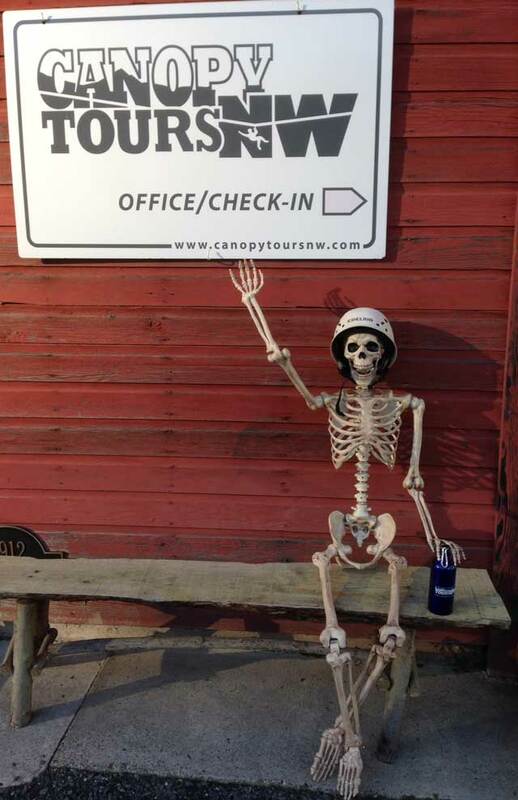 While we don’t tell our guests how to behave when they are not at Canopy Tours Northwest, we do believe guests will get the most out of their tour if they are free from the influence of alcohol or drugs. Whether due to intoxication or for any other reason, we do reserve the right to refuse service to and remove from the course anyone we perceive as compromising our ability to properly conduct tours. No. While we are dog lovers ourselves, the tour is not completely accessible by foot, so your loyal, four-legged friend would have a hard time keeping up with you. Also, we try hard to have as little impact as possible on the many creatures whose home is in our forest. For these reasons, dogs or other pets are not allowed on the tour. Is smoking permitted on the tour? No. Both for the safety of our guests and the protection of the forest, smoking is not permitted on the tour. Yes! It will surely be an experience to remember. I’m pregnant – is it okay to zip? No, we unfortunately cannot allow pregnant guests to zip. Are there weight or age restrictions? Yes. Guests must weigh between 65lb and 300lb and youth 12 years old and under must be accompanied by an adult. We weigh all participants at check in (don’t worry, we don’t say a thing). We do pass along the list of participant weights to our guides so they can give you a smoother zipping experience. Help — I can’t view the videos from my GoPro rental! While the vast majority of guests report no problems, a few have indicated their memory cards were empty, or the video was of poor quality, or other problems. Even in these cases, the videos are usually there and just fine. We have created a special page to help guests access them – view it here. Tipping is optional and we are happy to see the smiles on our guests faces. If you choose to tip and would like to show your enjoyment of the tour, typical canopy tour tipping is $5-$10 per person. Tour fees are fully refundable until 3 days before your scheduled reservation. Beyond that point, no refunds will be issued as tours are very difficult to book again on such short notice. Yes, please make a reservation using the button below. 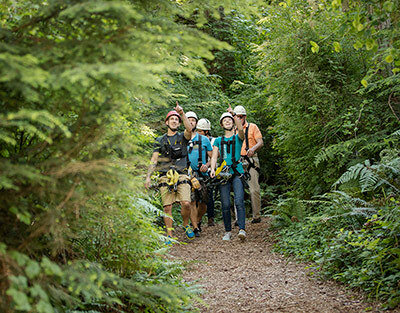 A Canopy Tours Northwest zip line tour is an excellent activity for families and also for corporate groups, teams, classes or large organizations. It is a fun and educational experience that is wonderful to share with others. If you are planning a larger group event, please check out our Groups Page or call our Groups Coordinator, Mona Campbell, at 360-387-5807 for rates and other information. Yes we can! We pride ourselves on making your group tour arrangements as easy as possible. We can scale with staff to meet the specific size and needs of your group. Learn more here or call our Groups Coordinator, Mona Campbell, at 360-387-5807. Do you sell Gift Certificates, and how do they work? Purchase online here or call us at 360-387-5807 (8:30AM – 5PM PST) if you would prefer to quickly handle everything over the phone. For the lucky recipient, redeeming and scheduling their tour is easy, too. They can look at available times online and then call (same number, 360-387-5807) to schedule. Gift certificates purchased either directly or through our Website never expire! We donate some gift certificates to support local charities and these donated do expire. If you got your gift certificate at a fundraising event, find the expiration date on the face of the gift certificate. Camano Island is a beautiful island with lots to see and do. Check out the visitors page here. The nearby towns of Stanwood, and La Conner are also fun to visit. The Pacific Northwest is a great place for hiking enthusiasts with a number of parks on Camano and Whidbey Islands as well as Deception Pass State park north of Camano Island. What about lodging or campgrounds near the tour? Find local area lodging and campground information on our Local Area Information page. Western Washington lives up to its reputation and gets periodic rain showers. While we think every day is a beautiful day at Kristoferson Farm, it is harder to enjoy if you are not prepared. Make sure to bring a rain jacket and shoes that will keep your feet dry. Umbrellas are not suitable rain protection for the tour. Can you recommend a nearby restaurant? We have listed nearby restaurants (with links) on our Local Area Information page. Where is Canopy Tours NW located? 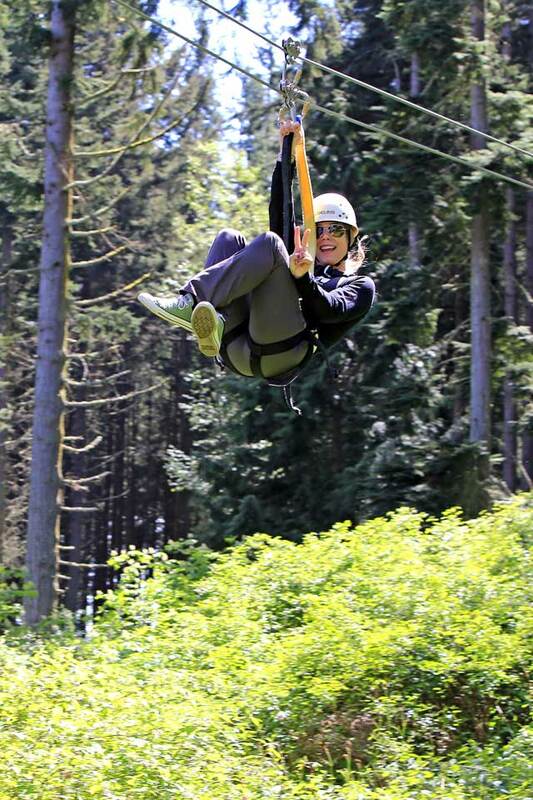 Canopy Tours Northwest is located on the beautiful Kristoferson Farm on Camano Island in Western Washington. Our address is 332 NE Camano Drive, about an hour’s scenic drive from Seattle. Is there a practice zipline? No. Participants get comprehensive instruction before beginning the tour then take to the trees assisted by their guides. How many zip lines do you have? 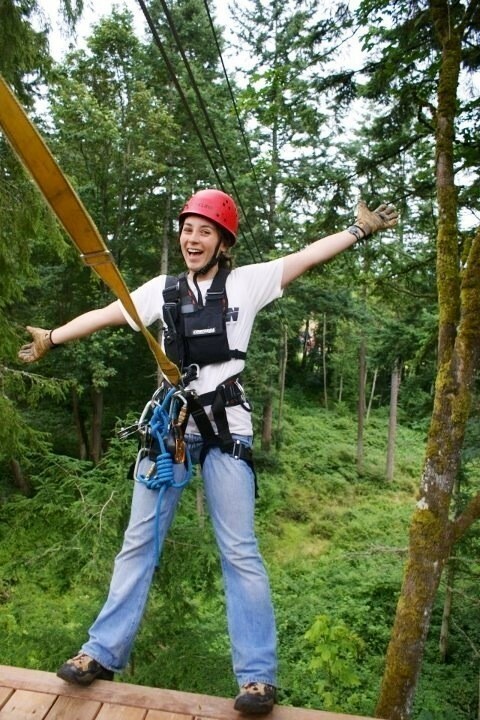 There are 6 thrilling zip lines plus a log bridge and final descent in our tour. There are two beautiful walks as part of your experience with Canopy Tours Northwest, the longest being around 5 minutes. The terrain is not difficult; participants walk on groomed forest trails. How do I slow down at the end of a zip line? Our lines have been installed so you are already slowing down as you approach the end platform. Additionally, we have guide-operated braking systems to assist in bringing you to a nice, controlled stop as you reach the end of the line. Your guide will then get you ready for your next zip! You can relax and enjoy the ride! What kind of ground transport is used for the tour? We access the start of the tour in a very cool 1963 Swiss Army troop carrier known as a Unimog! There are two short but beautiful forest trails we walk during the tour. It is best to wear seasonally appropriate, comfortable clothing, keeping in mind you will be spending 2-3 hours outdoors. Even in the warmer months, we recommend closed-toe shoes and you should wear garments you can comfortably wear a harness over. Remember you will be zipping through the canopy of trees so tie back long hair and don’t wear anything too loose fitting. The tours last about 2.5 hours with a full group. However, we ask that you arrive 30 minutes early to sign in, get your gear, etc. This means your total experience will be about 3 hours. 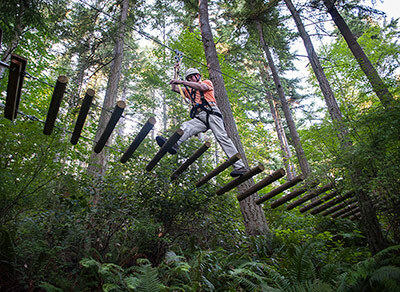 While there are inherent risks in any recreational activity; our tour has been built and certified to meet or exceed the ANSI-accredited ACCT guidelines. 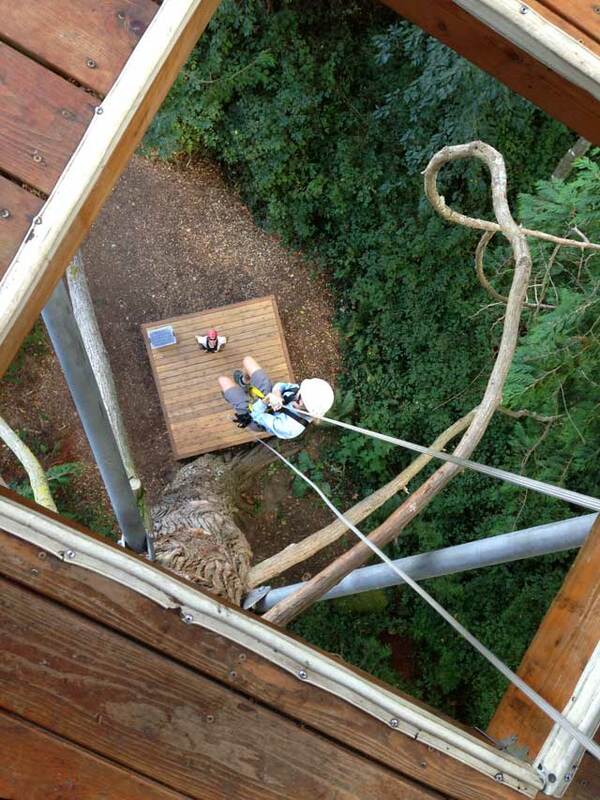 The zip line cables have a breaking strength exceeding 26,000 pounds. 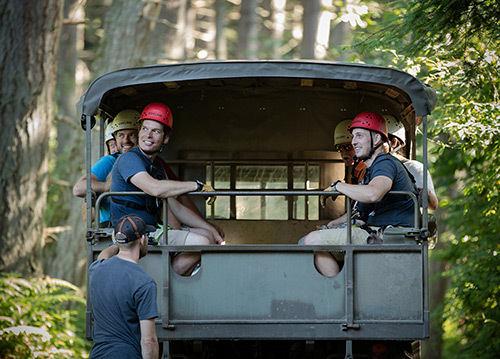 Our highly trained guides clip you into each line as well as a backup line throughout the tour. Our canopy tour is a forest experience like nothing else! You’ll zip between trees, riding on steel cables. Guests are outfitted with harnesses, helmets, lanyards and, of course, the trolleys which roll along the cables. Walking between the zips you will learn about the fascinating nature and wildlife and the rich history of the land. 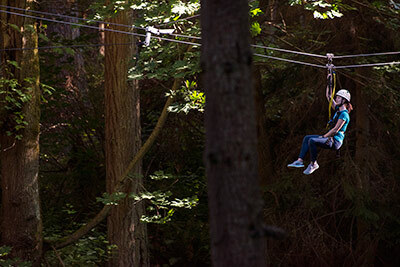 In the trees you will see an exhilarating new view as you zip along!